For years now, politicians have been promising to give away power. There has been growing acceptance that the scale and complexity of our social challenges are so great that the centre cannot hope to address them on their own. 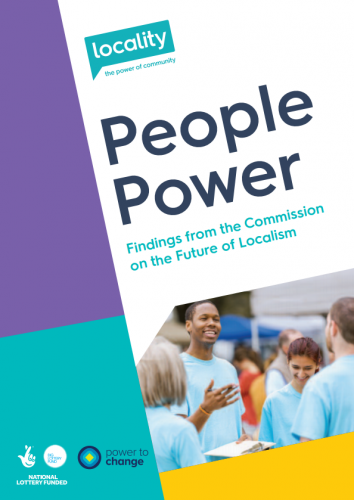 The Commission on the Future of Localism has gathered evidence on the outcomes and impact of recent initiatives to decentralise, with particular focus on the Localism Act 2011 and the Cities and Local Government Devolution Act 2016. Locality finds that these initiatives have stopped short of the radical reframing of power we require. Advocates for localism too often fall into a narrative trap of arguing for power to be 'handed' from the centre 'downwards' to communities, inevitably in ever diminishing packages. The consequence of a representative democracy is that expression of democratic participation can become largely transactional. Power is 'given' from the electorate to MPs and councillors at elections, and further political and policy engagement is too often limited to consultation, rather than collaboration and conversation. Reinvigorating localism requires a fundamentally different conception of power which puts people and communities at the starting point. Communities are already powerful – often far more than people recognise – but this power can lie latent, untapped, or simply ignored. What are the sources of community power?